Learn more about the Azerbaijan Grand Prix, F1’s newest race on the streets of Baku. The fourth edition takes place on April 25-28, 2019. Azerbaijan, a former Soviet republic between Eastern Europe and Southwest Asia, is the latest F1 destination with large oil reserves and a dubious human rights record. Disgraced former Renault F1 boss Flavio Briatore is said to have helped Bernie Ecclestone sign a deal for the race with the autocratic government of Azerbaijan, who are rumored to be paying around $50m USD per year in sanctioning fees. A ten-year contract was signed in April 2014, right before oil prices began a big slide. The new owners of the Formula 1 Group have not got off on the best foot when it comes to relations with the Baku organizers. New CEO Greg Maffei was quoted as saying that “races in places like Baku in Azerbaijan where they paid us a big race fee but it does nothing to build the long-term brand and health of the business. Our job is to find partners that pay us well but also help us to build the product.” The inaugural 2016 event was attended by just 30,000 fans over three days. 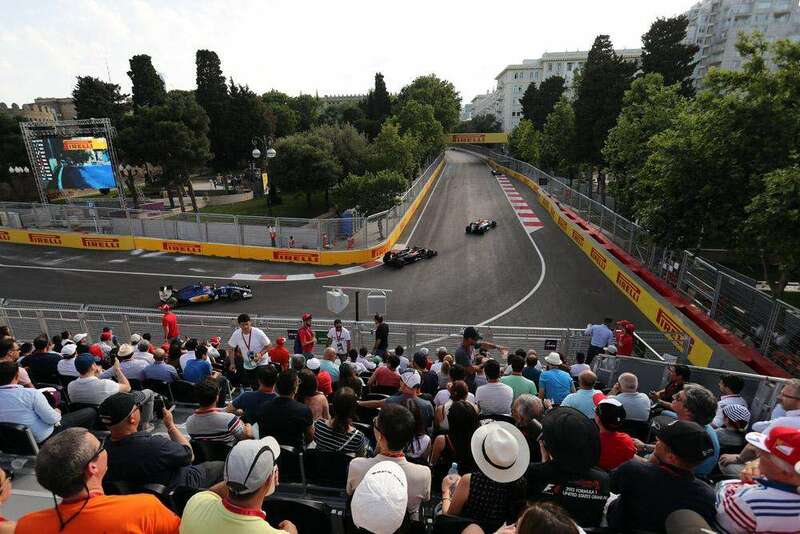 Attendance over the weekend rose to 71,541 in 2017, an increase of 138%, but Baku was still the least-attended race on the F1 calendar (read more about 2017 F1 attendance figures here). The Baku City Circuit was designed by Hermann Tilke, who has been responsible for laying out so many of F1’s newest tracks. It’s located right in the heart of the city, close to the main promenade on the Caspian sea. In addition to many long straights that make it the ‘fastest street circuit in the world’, the Baku circuit also includes a very narrow section (turns 8 through 12) next to the old city walls. At 6.003km, the Baku City Circuit is the second longest on the current F1 calendar after Spa Francorchamps (7.004km). Azerbaijan Grand Prix: did you know? The inaugural race in 2016 was officially called the “Grand Prix of Europe.” A race with this title has been held 23 times since 1983, most recently (before Baku) at the Valencia street circuit and the Nürburgring. The race was renamed the Azerbaijan Grand Prix for 2017. Nico Rosberg’s 2016 victory remains the only time so far that the polesitter at the Baku City Circuit has won the Grand Prix. During qualifying for the 2016 race, Valtteri Bottas of Williams set an unofficial record for the highest ever speed recorded in an F1 car at 378 km/h. Sergio Perez is the driver with the most podium finishes at this track, and the only driver to have finished in the top three in Azerbaijan more than once, having done so in 2016 and 2018. Lance Stroll was the second youngest driver ever to score a podium when he finished third in the 2017 race. Aged 18 years 239 days, he was only 11 days older than Max Verstappen was when he won the 2016 Spanish GP. Eighth on the grid has supplied more podium finishes than any other grid slot in Baku. Both Lance Stroll and Sergio Perez took third place finishes after starting from eighth in 2017 and 2018 respectively. 2016: A rather dull affair: The first race in 2016 was won by Nico Rosberg, who completed his second ‘F1 grand slam’ by also taking pole and fastest lap. Sebastian Vettel finished second for Ferrari and Sergio Perez completed the podium. Lewis Hamilton had ‘power deployment’ issues and could do no better than fifth. The race was one of the least eventful of 2016, with little in the way of passing and just four retirements, all mechanical. 2017: What a difference a year makes! The 2017 Azerbaijan Grand Prix was arguably the best race of the season, featuring several safety car periods, infamous crashes – including between team-mates! – and a fine win in the end from Australia’s Daniel Ricciardo. Ricciardo’s three-car pass into the first corner was judged the best overtake of the year, on his way to winning the race from tenth on the grid. Valtteri Bottas overtook Lance Stroll on the finish line for second place, while Stroll himself took the first podium finish of his career. 2017: Vettel loses his cool: The main talking point of the 2017 event was Sebastian Vettel’s frustration under the Safety Car period, as he infamously drove into the side of championship rival Lewis Hamilton. Vettel was given a ten second stop/go penalty for the incident, costing him the race win. 2018: Hamilton wins in the closing stages: The race delivered again in 2018, and was another one of the most memorable races of the year. A first lap coming together shunted Esteban Ocon out of the race, while Fernando Alonso made a miraculous return to the pits with a double puncture. The Red Bull drivers battled hard throughout the race, but their race ended in disaster as they came together at the end of the straight. While Romain Grosjean managed to crash under Safety Car conditions, Sebastian Vettel locked up into the first turn at the restart, handing the lead to Valtteri Bottas. Bottas ran over debris with just a few laps remaining, giving him a puncture and leaving Lewis Hamilton to take a fortuitous victory. Your trackside guide to the Baku City Circuit and the Azerbaijan Formula 1 Grand Prix, including the full on-track schedule. Here’s everything you need to know ahead of the 2019 Azerbaijan Grand Prix weekend! Work out the cost of your trip to Baku for the Azerbaijan Grand Prix. 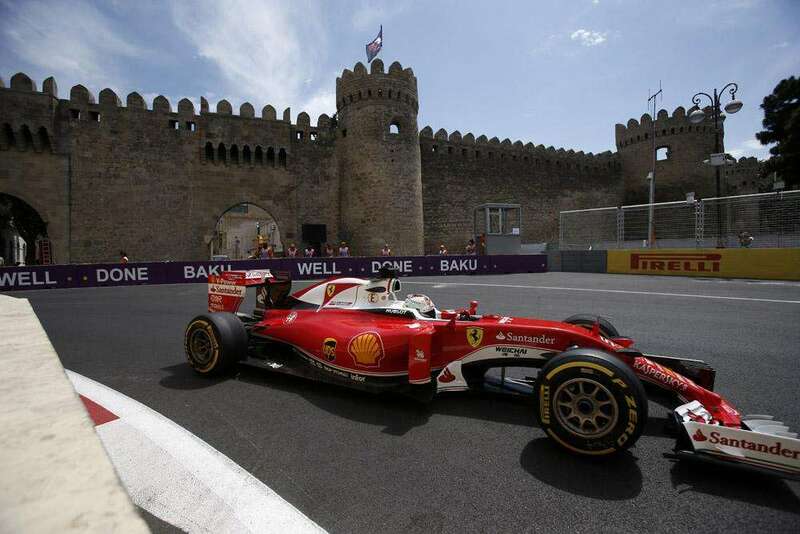 Start planning your trip to Baku for the Azerbaijan Formula 1 Grand Prix. The next race takes place on April 25-28, 2019. 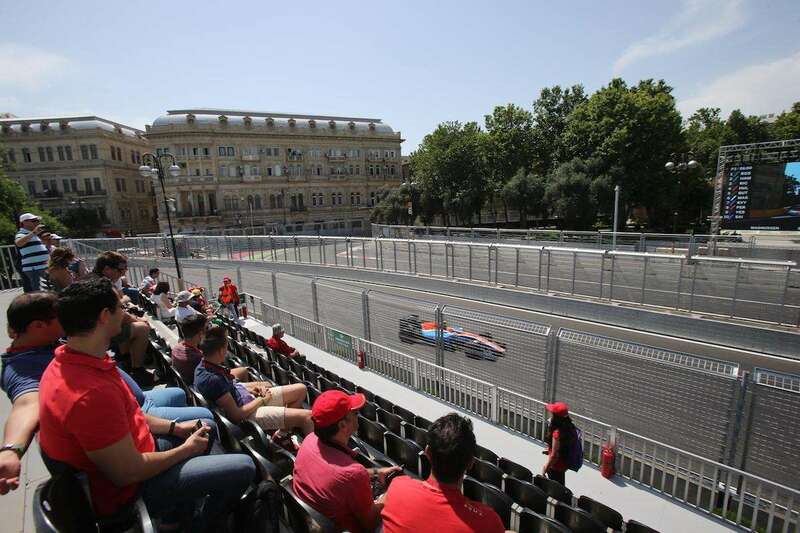 Advice on buying tickets to the 2019 Azerbaijan Formula 1 Grand Prix at the Baku City Circuit. How to get to Baku for the 2019 Azerbaijan Grand Prix, plus advice on getting around in the city on April 26-28. The best places to stay for the Azerbaijan Formula 1 Grand Prix in Baku.